Written by 11/23/2009Share this story on Facebook! As a business administration major at Ithaca, Amber Spiegel ’05 spent her free time making bread and desserts for her roommates. “I was the resident baker,” Spiegel says. After deciding to make a career out of her hobby, she continued her studies at the Culinary Institute of America. But it was her Ithaca education that allowed her to take the next step. “My background in business administration and marketing gave me courage to pursue my own business,” says Spiegel, who went on to launch her own cookie company, creating themed confections for weddings, parties, promotions, and gifts. 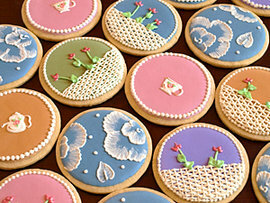 Take a look at Spiegel’s mouth-watering works of art on her blog or buy some from her Etsy shop, SweetAmbs.